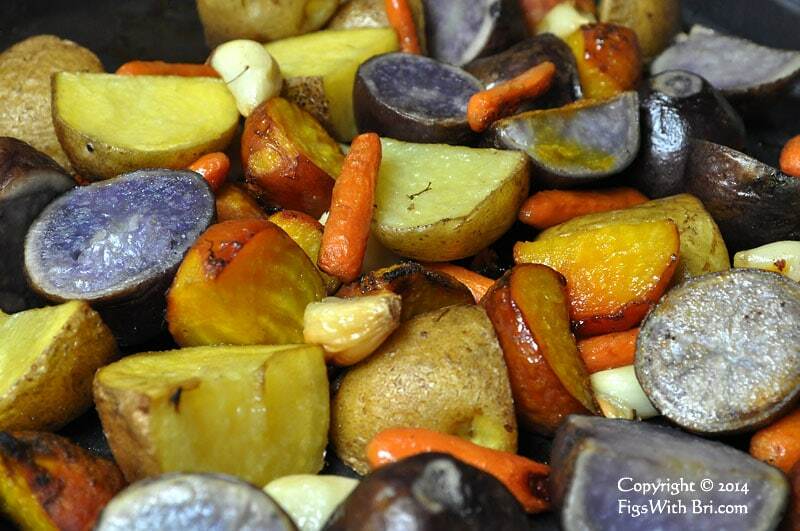 A rainbow of Roasted Root Vegetables: Yellow & purple ‘blue’ Potatoes, golden Beets, orange Carrots, and Garlic cloves combine for a delicious hearty winter meal. Thanksgiving, our annual harvest holiday here in the United States, is just around the corner. Cooks planning Thanksgiving celebration feasts select favorite family recipes and traditional holiday offerings for these festive meals. Some folks make the same recipes year after year. Others of us, who no longer eat turkey or canned cranberry sauce, experiment by adding seasonal produce and new recipes for these special holidays. If you’re looking for new ideas or easy hearty autumn recipes, consider celebrating Thanksgiving with savory roasted vegetables! 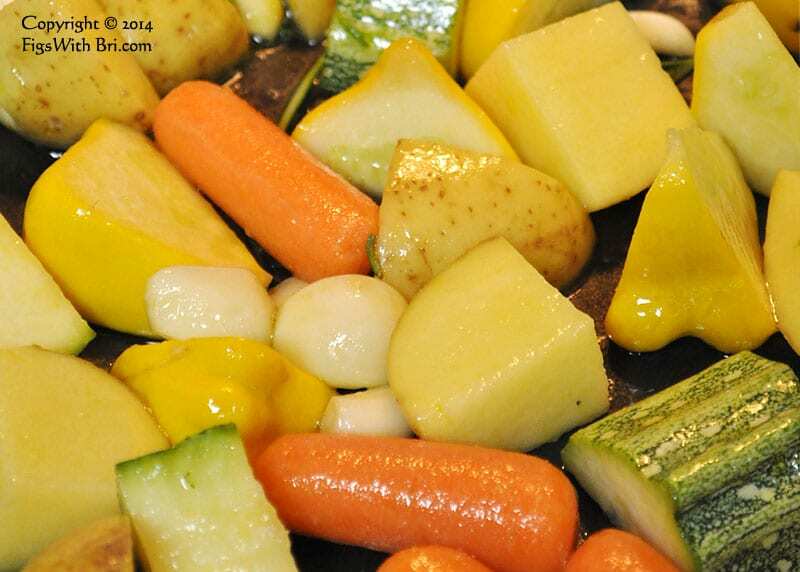 Easy, Creative, and Versatile ~ Roasted Root Vegetables are Delicious! 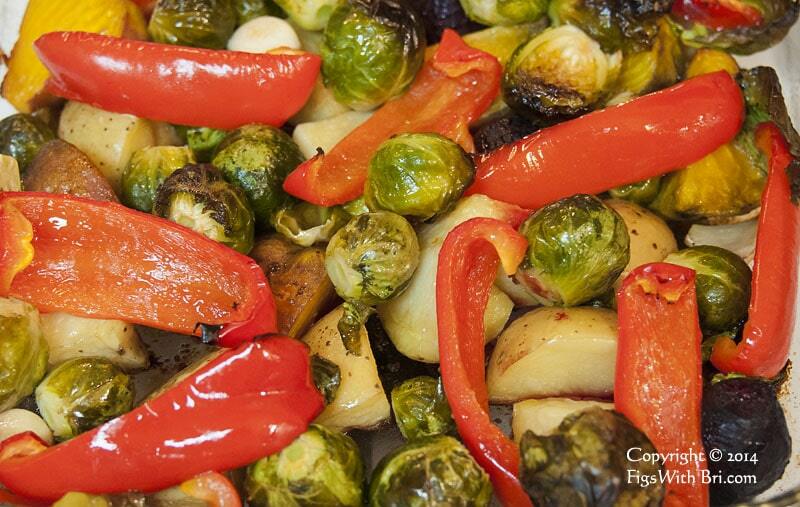 Roasted Brussel Sprouts, Sweet Red Peppers, Potatoes, Golden Beets, and Garlic. Made this in February even though it would be a wonderful red – white – and green Christmas dinner course. Since Briana introduced us to roasted vegetables…my husband and I have perfected our preparation & baking techniques. (Read our step-by-step description at the link.) We’ve made roasted vegetables more creative by using heirloom and new produce varieties to create color themed combinations. If you enjoy color and creative challenges, look for ideas as you wander the grocery produce department or your local farmers market. 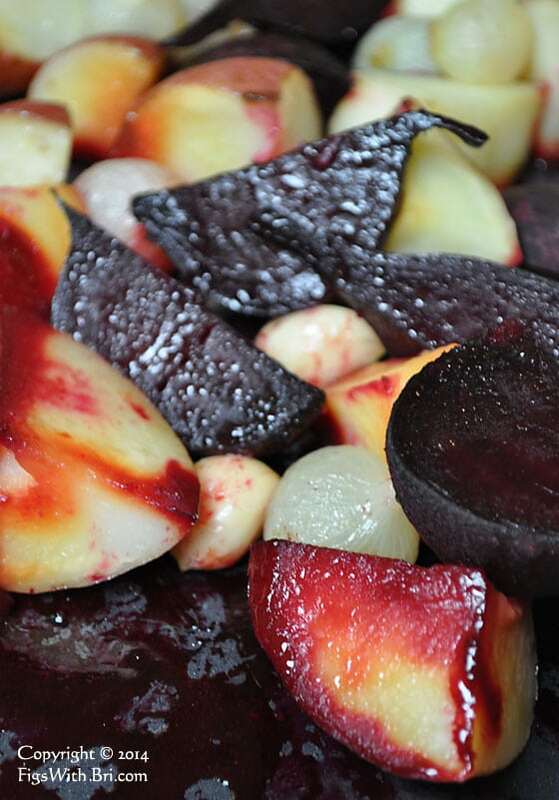 Autumn vegetables in a palette of burgundy, rose and white: dark purple Beets, red-skinned Potatoes, baby Onions and Garlic cloves. 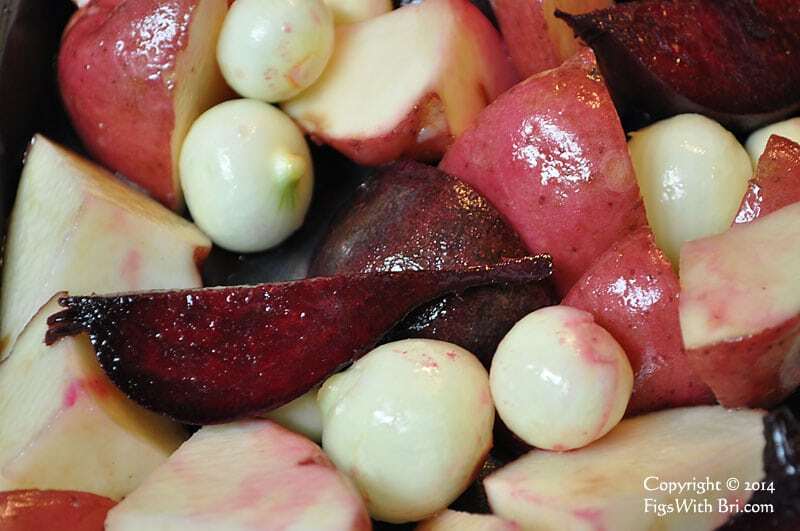 Succulent roasted autumn vegetables create an attractive course in a burgundy, rose, ivory and white: dark purple Beets, red-skinned Potatoes, baby Onions and Garlic cloves. We eat roasted seasonal veggies year round. And suggest not to forget summer produce…mid-summer veggies like tender squash, new potatoes, sweet peppers, and baby onions are delicious roasted, too! 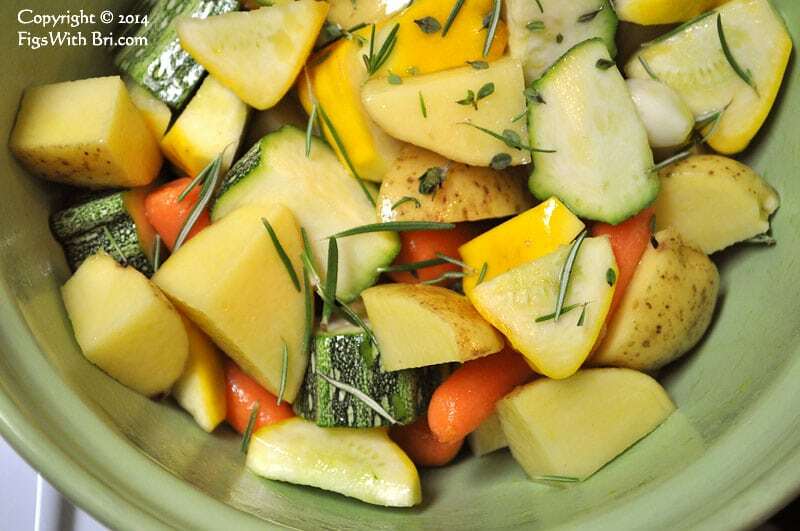 Summer Veggies ready for roasting: Striped Zucchini, yellow Patty pan Squash & Potatoes, bright orange Carrots, and Garlic sprinkled with lemon thyme & rosemary. Summer Veggies waiting for roasting: Striped Zucchini, yellow Patty pan Squash & Potatoes, bright orange Carrots, and Garlic coated with salted virgin Olive Oil.